There has been said and written much about the end of the Palm OS era. Now it’s no longer a secret that this operating system lives its last successful year with mass sales, then it won’t exist. There is a so-to-say Palm OS heir (ACCESS Linux Platform, namely), which will have little in common with the old operating system, but the emulator to launch old Palm OS programs. It won’t have even the name Palm. Only most faithful fans do still like and believe in Palm OS. Actually if everything works well and the user got used to it, why should he or she change a customary and “friendly” operating system Palm for an “enemy” Windows Mobile? 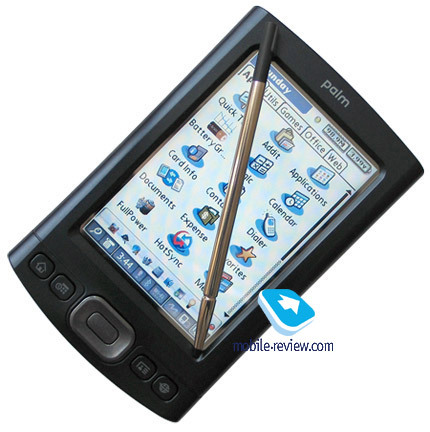 After Sony had left the PDA market, Palm lost its only serious platform rival. The company is following the way of the least resistance investing the minimum into the development, this approach turns to be justified in this case. What’s the use of developing new design and adding something brand new, if the user targeted at a Palm OS PDA (to replace the old one) will buy the PDA by Palm, as there is simply no alternative. The company should slightly refresh design from time to time and vary the price to win the replacement market. The great army of the users of palm OS-devices has never disappeared, some users switch to Windows Mobile, but the rest part is faithful to Palm OS. The second reason that where won’t be dramatic changes in Palm PDA is the switch from ordinary PDA to communicators. In 2006 the number of new communicators will equal to the number of new PDA for the first time. To say the truth, other PDA makers follow the same road with Palm. I suppose that after you’ve read the introduction, you won’t be surprised that Palm TX is eventually a copy of Palm Tungsten T5 with minor changes. 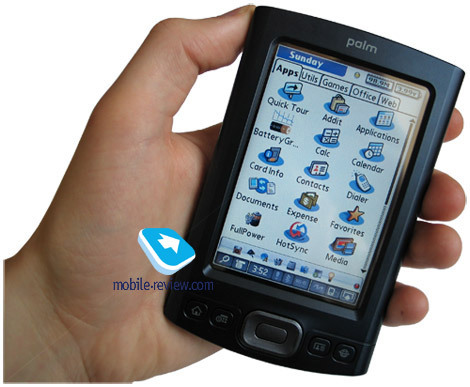 However you shouldn’t think that Palm TX is a failure, which shouldn’t be on the market. On the contrary taking into account some features the model is out of competition, especially with its price. Let’s try to see all the pluses and minuses of the Devon (the code name of Palm TX). To reduce PDA line the company decided to abolish its sub-brands, such as the Tungsten and the Zire. Instead we see only the first letter in the model’s name. So the model is called Palm TX and not otherwise. You won’t see the old names on the shell, the package or the manual. 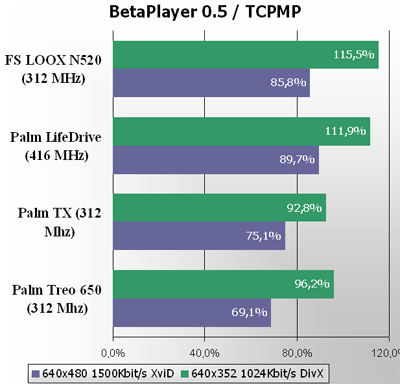 Palm TX – simplified or improved Palm T5? Less flash-memory size onboard, lack of USB-drive mode. There is no sense in describing design and control elements of Palm TX. Except for Dark Blue shell color, we have a customary design applied for the first time in Palm Tungsten E, and then reproduced to palm Tungsten T5 and Tungsten E2. 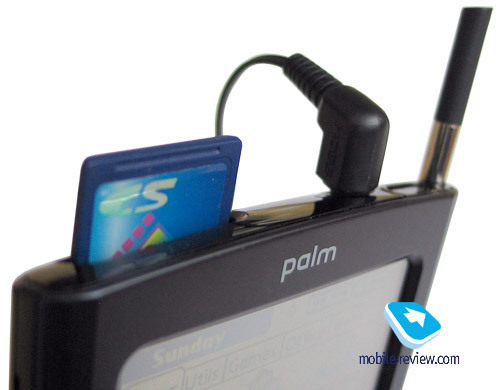 So we’ll resume a part of previous review on Palm T5. As for dimensions and weight, they are average for latest Palm handhelds, noticeably bigger than the TT3 when folded, slimmer than dual slot Pocket PC and more massive than modern Pocket PC. With the Wi-Fi module Palm TX weighs some grams more than the previous model. The shell is made of plastic, but it feels like metal. It makes a nice impression in hands on the whole. The application buttons and the joystick under the screen prove to be comfortable while handling documents and games. They are positioned within good distance and feature optimum size. They are completely identical to the Tungsten E and the Tungsten T5. There aren’t LED indicators above the screen or any control elements at sides. Both left and right sides have nothing, including the voice recorder button. Traditionally we see on the top an expansion slot for SD/MMC cards, a standard jack for headphones (with customary perfect sound of MP3), a power button and a silo. I’d mark the stylus pen, which features optimum dimensions and weight for the touchscreen LCD. Well, we have the same stylus with the Tungsten T5. At the back panel we find a speaker and a dipped reset button (you should unscrew the stylus to press it). At the bottom there is nothing except for a multi-connector. The sales package lacks a cradle, this is traditionally since the TT5, the TT3 kit contained it. There is a USB-cable with HotSync button instead of the cradle. There is a nice little stuff included – the protective screen foil. As for its quality it is far from the ideal, but it is still nice to have it. The protective cover is mounted at side. I liked it on the whole – it copes well with its task, protects the screen from damages. It has an expensive look and is nice to touch. It has inherited a big flaw from its predecessor – when the handheld rests in the pocket, the cover constantly presses buttons and the joystick, so you lack Hold button, which used to be essential part of Sony handhelds and now can be met more often in Windows Mobile devices. The LCD features a 320x480 pixel (HVGA) resolution, which is between QVGA and VGA screens on Pocket PC (picture quality, screen size). We can compare it with the Tungsten T5 – the same size, the same specs, good color rendering, behavior under the sun and perfect viewing angles. According to Palm, the new LCD is about a third better than the predecessor, however in reality you’ll hardly notice the difference – the LCD makes the same good impression like the Tungsten T5, there isn’t a noticeable difference, as company’s marketing specialists would like to be. The minimum backlight level allows comfort reading of a book, for example, in the dark. I’d mark you won’t find a handheld with the comparative LCD quality for $300. The high quality LCD is the greatest advantage of the model. As we’ve already mentioned they reduced available flash-memory size to 100 MB (of 114.8 MB, if have a look at memory distribution) against 161 MB in Palm T5. There is no USB-drive mode. With the SD slotwe shouldn’t care much about the internal memory onboard. Palm TX is powered by a new Intel XScale PXA270 312 MHz processor. Subjectively it’s hard to see the difference in speed compared to Palm Tungsten T5, if not to activate video playback. Synthetic tests revealed some peculiar things, for example: strange results of graphic tests (long pixel drawing time in LCD Analyzer along with high graphic results with pBench). The developers might have tried to optimize the operating system for Wireless MMX technology built in Intel processor. Let’s see the results of video tests, it’s difficult to watch video without conversion (like on Palm LifeDrive, for example). However after the conversion of the video into the file with lower bitrate, no problems arise any more. The resume on the productivity is simple: if not take into account video playback, lower CPU rate isn’t that important, you’ll hardly notice the difference in ordinary applications. The handheld is equipped with a non-removable Li-Ion 1300 mAh battery (under some other info – 1250 mAh, the capacity wasn’t officially announced), that’s much higher compared to a 900 mAh battery of the Tungsten T3. Relatively high battery capacity hasn’t improved battery life. Under the maximum load the PDA lasted for 4 hours on a single charge (video playback from the card, the highest backlight level) due to the battery capacity. In the MP3 mode with the screen off the battery life was only 9 hours. In the reading mode (the minimum backlight level, iSilo application with active auto scroll) Palm TX worked 6 hours sharp. We have an impression nobody cared about optimizing PDA power consumption, remember the remaining alert of a low battery level (at 20%), which have no longer sense with the new file system: you won’t lose data at the full battery discharge. Palm TX is equipped with Bluetooth 1.1 module. 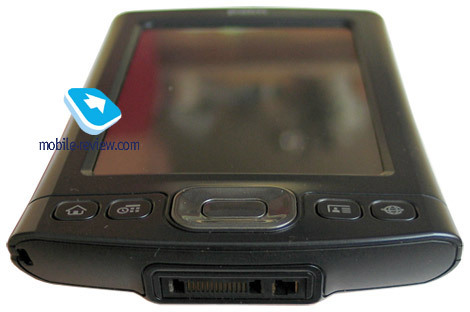 There are no changes in Bluetooth work compared to Palm Tungsten T5, they have similar opportunities. That is, in this aspect this is the best PDA among other Palm OS devices, however it is still behind Windows Mobile devices. The key advantage of this model is an integrated Wi-Fi module. If you have a hot spot at home or in some public place (in the airport, for example), you can get the access to the files stored on your PC and high speed Internet connection. The application of Wi-Fi in Palm OS has been always limited because of the lack of multi-task opportunities. For example, you can’t receive e-mail and download Internet pages at a time, that happens with most applications with minor exclusions. Wi-Fi indicator is always at the bottom in the status bar showing the signal power. If you happened to set Wi-Fi connection, you’ll hardly face any problems with settings and connection here. There is all necessary security settings (WEP, WPA) and some other connection settings. The signal sensitivity is fine. On the whole the implementation of Wi-Fi is good. 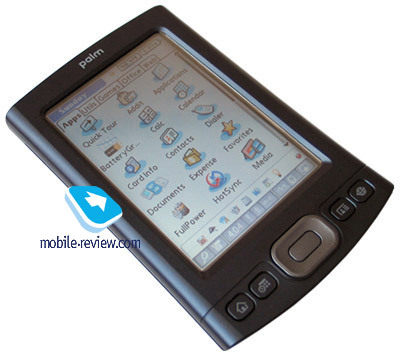 The PDA has Palm OS 5.4.9 version. Plenty of built-ups and improvements against the basic version are Palm doings, but not PalmSource. We speak about improved built-in applications, status bar and single-handed navigation. There are several ways to enter info in the PDA: the virtual keyboard, Graffiti 2 manuscript text recognition system, the opportunity to plug an external keyboard. At the bottom of the screen you see the status bar with icons, which simplifies the work. It got somewhat different compared to Palm T5. From left to right: Magnifier – ordinary search engine; Menu – launches menu in any application; Clock – displays current time, tap it to see battery power left, available memory, the level of backlight and sound (the photo below); Bluetooth icon stands for Bluetooth activity: similar Wi-Fi icon; Exclamation mark – a prompt in different applications; Screen rotate and Graffiti icon. Main built-in programs stay the same from device to device. The set of them has been slightly changed compared to Palm T5. AddIt.With this application you can download the utility directly to the PDA, pay for it, if you’ll like it. A peculiar feature about it is the subscription to Reuters news block. Calc.It’s the built-in calculator. Two versions are available: simple (basic mathematical actions) and advanced (engineer). Calendar.It keeps the working schedule. There are several previews available. The so-called Agenda, an analog of the Today screen for Pocket PC, displays today’s events, active tasks and unread e-mails. The second preview is for the day schedule. The rest preview modes are for week and month. Card Info.The utility displays the card information, It’s possible to format the card using this utility. Contacts.Work with contacts. You can dial numbers or send SMS right from this application (Bluetooth connection should be established). You can attach a photo, there are 17 fields available (you can change some of them choosing the field name from the list). In addition there are 3 extra fields (phone/e-mail, IM and address) the user can give names to 9 fields. It’s possible to add text notes. The contacts are easily synchronized with MS Outlook, including also contacts in the Russian language. Photo contacts are also synchronized with MS Outlook 2003 or higher. Dialer.This application is to dial numbers from PDA. HotSync.This is a PC synchronization client. The synchronization runs via USB and Bluetooth. There is no need to do or adjust anything in this program (with a rare exception of remote synchronization). Media.It views photos, it’s possible to run slideshows. You can rotate photos, add pen inscriptions, set wallpapers, copy files from the phone memory to the memory card. NotePad.This is a more powerful tool for notes, you can write them by hand, change colors and line width. Pocket Tunes.Built-in audio player. It seems that after the LifeDrive this player becomes the standard for Palm. It’s good news, as this is one of the best players for Palm OS. Tasks.It’s useful to manage tasks. You can set priority and due date. VersaMail.This built-in mail client is not bad. You’d have to constantly change encodings to read letters in Russian. Web.This web browser displays sites well stretching the contents into a single column. The main flaw is the problems with the Russian language. Pages are downloaded much faster than with Pocket IE of Windows Mobile. DataViz Document To Go.A powerful package to edit original MS Office documents without the preliminary conversion. For comparison we had two MS Office documents, edited them with Palm and saved (MS Word and MS Excel). I’d note than when we edited the Excel document, the Russian language was displayed, and in case of the Word document it totally disappeared. In both cases we lost the formatting. We tested it with the latest version of the official russificator. If we consider Palm TX from the point of view of a faithful Palm OS user, the model with a $300 price tag (in Russia slightly more expensive) is ideal to replace the old handheld, which got lost/ broken/ outdated. The model simply has no direct rivals. The matter in the assessment here is with old models such as Palm Tungsten T3, T3, you shouldn’t replace them, if you don’t really need Wi-Fi. If we compare Palm TX with Windows Mobile devices, well, on one side we have a higher quality LCD for its price segment, high assembly quality and solid design. On the other side we have short battery life, non-removable battery, the absence of the voice recorder, external indicators and the GPS module, plus notorious Palm OS limitations (lack of multi-task feature and problems with local languages). I think it will be more logical for future models of the T-series to have larger flash-memory size (1GB, for example), and an integrated GPS-receiver might also bring to life the old device.